MacBook One 調效手冊: 十十十吋的Aspire One!! 好美呀!! 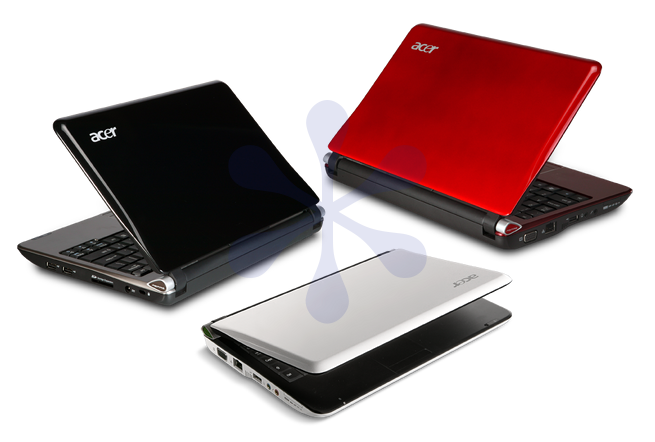 It is probably not suprising, considering the success of the Acer Aspire One, that Acer is currently preparing a new model. It won't be a true successor but just a new variant of the AA1. Digitimes did already report in November that the 10.1" AA1 will be released in February 2009, but no details were known then. Here are the details. Most specs are identical to the AA1, there are only a few changes. First the bad news: it will likely be Windows XP and HDD only, no Linux or SSD SKUs. Probably false alarm. There will only be no HDD and Linux combination, which is currently available in parts of Europe. The Storage Expansion slot has been removed, and a multicard reader put in its place. The functionality of the current Storage Expansion in Linux is entirely software based anyway. No onboard memory. There is only a single DIMM slot now, with a maximum capacity of 2GB. The screen is 10.1" with the same resolution as the current screen. 3G and Bluetooth 2.0+EDR are optional. A few changes were made to the design as well. The area around the keyboard has a brushed metal finish and the seamlessly integrated touchpad resembles a more traditional touchpad, compared to the current one, with what appears to be a single button at the bottom. The new AA1 will be available in three colors: white, black and red.